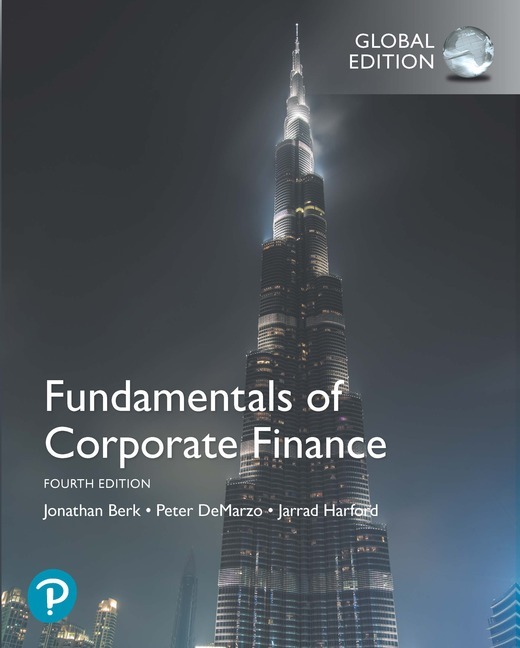 Fundamentals of Corporate Finance offers a practical introduction to modern-day core principles, arming students with a problem-solving methodology, real-life financial management practices, and an overarching valuation framework that they can apply in their future careers. Updated with new examples, exercises, and statistics, the 4th Edition gives students the opportunity to practice and apply course concepts, while connecting them to the latest financial issues and policy in today’s world of business. Pearson MyLab Finance not included. Students, if MyLab is a recommended/mandatory component of the course, please ask your instructor for the correct ISBN and course ID. MyLab should only be purchased when required by an instructor. Instructors, contact your Pearson rep for more information. Pearson MyLab Finance is an online homework, tutorial, and assessment product designed to personalize learning and improve results. With a wide range of interactive, engaging, and assignable activities, students are encouraged to actively learn and retain tough course concepts. With an emphasis on bridging theory to practice, the authors help students master the core concepts and solve problems that today’s practitioners face. The Valuation Principle is presented as the foundation of all financial decision-making. The central idea is that a firm should take projects or make investments on the firm’s value by comparing the costs and benefits in equivalent terms. Guided Problem Solutions are examples that accompany every important concept using a consistent problem solving methodology that breaks the solution process into three steps: Plan, Execute, and Evaluate. Personal Finance GPS examples showcase the use of financial analysis in everyday life by setting problems in scenarios such as purchasing a new house or car, and saving for retirement. Common Mistake boxes alert students to frequently made mistakes stemming from misunderstanding core concepts and calculations—in the classroom and in the field. Timely, practical applications prepare students to use financial concepts in their future careers. UPDATED! Practitioner Interviews from notable professionals highlight leaders in the field and address the effects of the financial crisis. In the 4th edition, new interviews are included from executives from NASDAQ, Oracle, Google, AngelList, and more. Global Financial Crisis boxes throughout tie the material to aspects of the 2007-2009 financial crisis. UPDATED! Data Cases and Integrative Cases give students a chance to apply the material with realistic data-analyzing exercises and problems that integrate material across chapters in each major part of the book. Chapter-Opening Interviews with recent college graduates now working in the field of finance underscore the relevance of the concepts to students who are encountering them for the first time. Integrated support for Microsoft® Excel® and the financial calculator will save instructors class time while allowing students to “think finance” using the requisite tools. UPDATED! Using Excel boxes describe Excel techniques and include screenshots to serve as a guide for students using this technology. EXPANDED! Excel End-of-chapter Problems indicated by an Excel icon have instructor solutions and student templates available in Pearson MyLab Finance. Because one of the hardest parts of learning finance is mastering the jargon, math, and non-standardized notation, the authors systematically use notation boxes, numbered and labeled equations, and timelines. Financial Calculator instructions show the keystrokes and screenshots for how to solve problems using the HP-10BII and TI BAII Plus Professional calculators, allowing students to get just-in-time help as they study. Spreadsheet Tables, available in Pearson MyLab Finance as Excel files, enable students to change inputs and manipulate the underlying calculations. To learn finance, students need to practice finance, and instructors have flexibility in designing their assignments with a wide range of problems, cases, and projects. NEW! And REVISED! End-of-Chapter Problems written personally by Berk/DeMarzo/Harford offer instructors the opportunity to assign first-rate materials to students for homework and practice with the confidence that the problems are consistent. In addition, every single problem is available in Pearson MyLab Finance, the groundbreaking homework and tutorial system that accompanies the book. Pearson MyLab Finance Chapter Summary presents the key points and conclusions from each chapter, provides a list of key terms with page numbers, and indicates online practice opportunities. Pearson MyLab Finance not included. Students, if MyLab is a recommended/mandatory component of the course, please ask your instructor for the correct ISBN and course ID. Pearson MyLab Finance should only be purchased when required by an instructor. Instructors, contact your Pearson representative for more information. NEW! Auto-graded Excel Projects. Using proven, field-tested technology, auto-graded Excel Projects allow instructors to seamlessly integrate Excel content into their course without having to manually grade spreadsheets. Students have the opportunity to practice important Finance skills in Microsoft Excel, helping them to master key concepts and gain proficiency with Excel. Students simply download a spreadsheet, work live on a finance problem in Excel, and then upload that file back into Pearson MyLab Finance, where they receive reports on their work that provide personalized, detailed feedback to pinpoint where they went wrong on any step of the problem. These reports generate within minutes of submission. Question Help. Pearson MyLab Finance homework and practice questions are correlated to the textbook, and generate algorithmically to give students unlimited opportunity for mastery of concepts. If students get stuck, Learning Aids including Help Me Solve This, View an Example, and a Financial Calculator walk them through the problem and identify helpful info in the text, giving them assistance when they need it most. Financial Calculator. Students have access to a fully functional financial calculator inside Pearson MyLab Finance and a financial calculator app that they can download to their iPhone®, iPad®, or Android device. Video Series. Conceptual videos on several topics that can be challenging for students to grasp, including Default Risk, Market Efficiency, Diversification, Mutual Fund Performance, and more are available for instructors to assign in the assignment manager, or for student self-study in the multimedia library. UPDATED! Interactive Figures. Select in-text graphs and figures have been digitally enhanced to allow students to interact with variables to affect outcomes and bring concepts to life. Personalized Learning. Not every student learns the same way or at the same rate. With the growing need for acceleration through many courses, it’s more important than ever to meet students where they learn. Personalized learning in Pearson MyLab Finance gives you the flexibility to incorporate the approach that best suits your course and your students. The Study Plan acts as a tutor, providing personalized recommendations for each of your students based on his or her ability to master the learning objectives in your course. This allows students to focus their study time by pinpointing the precise areas they need to review, and allowing them to use customized practice and learning aids—such as videos, tutorials, and more—to get them back on track. Using the report available in the Gradebook, you can then tailor course lectures to prioritize the content where students need the most support—offering you better insight into classroom and individual performance. Dynamic Study Modules help students study effectively on their own by continuously assessing their activity and performance in real time. Here's how it works: students complete a set of questions with a unique answer format that also asks them to indicate their confidence level. Questions repeat until the student can answer them all correctly and confidently. Once completed, Dynamic Study Modules explain the concept using materials from the text. These are available as graded assignments prior to class, and accessible on smartphones, tablets, and computers. NEW! Instructors can now remove questions from Dynamic Study Modules to better fit their course. Reporting Dashboard. View, analyze, and report learning outcomes clearly and easily, and get the information you need to keep your students on track throughout the course, with the new Reporting Dashboard. Available via the Gradebook and fully mobile-ready, the Reporting Dashboard presents student performance data at the class, section, and program levels in an accessible, visual manner.